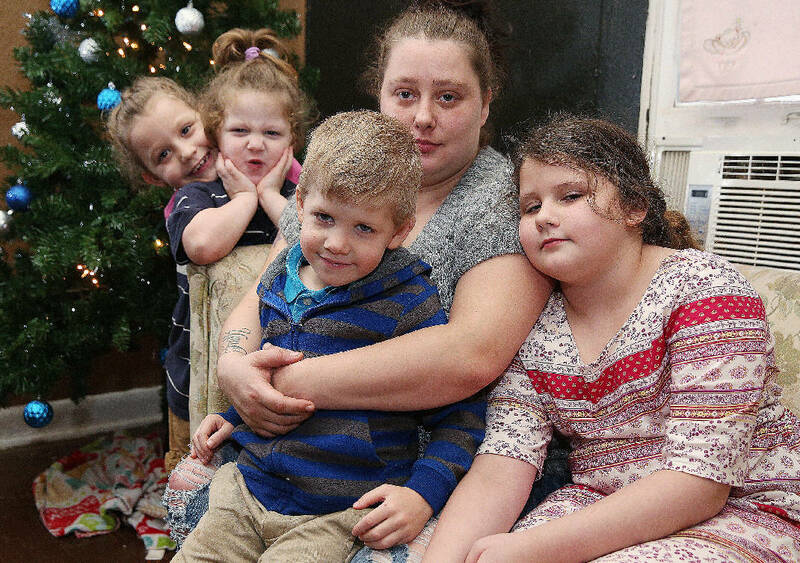 Shianne Everett, 7, Andrew Sky Merritt, 4, Konner Merritt, 7, Natasha McCarty and Jahnomie Everett, 9, pose for a photo at their Chattanooga, Tenn., home Thursday, Dec. 21, 2017. Natasha and her family received help from the Chattanooga Times Free Press Neediest Cases fund to assist with rent. Anyone walking into the McCarty-Merritt household will be greeted by Shianne Everett, an energetic 7-year-old who likes doing cartwheels in the family's living room in front of the Christmas tree. Shianne had her long, blonde hair tied back in a braid on this day and wore a bright pink shirt and glittery leggings. She and her 4-year-old brother Andrew Merritt, called "Sky" by the family, ran around the living room jumping from couch to couch until the promise of brownies drew them into the kitchen. Natasha McCarty's five children, all between the ages of 4 and 13, have enough energy to tire out their 5-month-old, blue-nosed pitbull Sapphire. "Sapphire is a blue color," explained Shianne, who insists she is 7-and-a-half — an important distinction at that age. McCarty, 27, said she and her family received help from the Times Free Press Neediest Cases Fund to keep their large family in their home after her fiancé, 27-year-old Terri Merritt III, lost his job a few months ago. The fund, with the help of Family Promise of Greater Chattanooga, provided $300 for the family's rent. Chattanooga Times Publisher Adolph Ochs started the Neediest Cases Fund in 1914 as a way for community members to help others in their city with a one-time financial donation. Continued by the Chattanooga Times Free Press, the fund is managed by the United Way of Greater Chattanooga. It can help families and individuals with a variety of needs, such as rent, medical expenses or utility bills. Sitting on the couch and watching her children eat brownies by the TV, McCarty recalled when her family was evicted from their home in Georgia last year. The couple ended up in a hotel in Chattanooga with the five children, who include 7-year-old Konner Merritt, 9-year-old Jahnomie Everett and 13-year-old Kaylee McCarty. After finding enough money to move into their current home in February, McCarty's fiancé unexpectedly lost his job after he became ill, she said. That is when she began calling around for help and was connected with Family Promise representatives, who told her the fund could partially pay for the family's rent. "I did everything I could and got it down to $300," McCarty said. "I was very excited because we were all caught up with the bills." A stay-at-home mom, McCarty said she hopes never to go back to living in a hotel with her five children. "I'm staying on top of it," she said. "I'm never going to be homeless again."